Our broadest granting program which provides grants each year to support projects undertaken by charitable organizations within the greater Kingston area. It is funded each year from earnings on our pooled Community Fund, new Smart & Caring Community Fund and over 40 individual endowment funds established by our generous donors. Twice a year, applications are invited for project proposals, which are reviewed by our local volunteer Grants Committee. Applications are invited twice a year, and will be accepted until 4:30 pm on February 15th of each year (for the spring grants round) and until 4:30 pm on September 15th of each year (for the fall grants round). In years in which a submission deadline falls on a weekend, the actual deadline will move to the first working day following these dates. The Community Grants program provides grants in all the Foundation’s fields of interest: Arts and Culture, Community Development, Education and Literacy, Environment, Health and Social Services, Heritage Preservation, Recreation, Youth and Children’s Mental Health. Preference is given to projects that align with our Smart & Caring Community priority areas: Getting Started, Food Security, and Community Engagement. 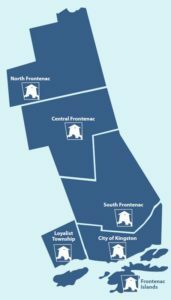 City of Kingston, Loyalist Township, Township of Central Frontenac, Township of Frontenac Islands, Township of North Frontenac, Township of South Frontenac. Environmental projects must lie within this area and/or in the Cataraqui Watershed. Children’s Mental Health projects may be in the above or in Lennox & Addington County. Projects must meet the general eligibility criteria that apply to all our granting programs. Projects must have a well-defined and innovative purpose and take place within one year of receiving the grant. This granting program is intended for projects, not ongoing operations or programs. Any final reports due for previous completed projects funded by the Foundation must have been received and approved. to support the operating expenses of established organizations or programs (including predictable replacement of office equipment). Preference is given to new initiatives, but a promising program may receive more than one grant provided there is evidence that the program is developing successfully. An established program may receive a grant when it faces a new opportunity or an unexpected problem. Our Community Grants application process is now one stage only. The application form and guidelines are available at the bottom of this page. The application deadline is now the 15th of February and September. The general eligibility requirements as listed above remain the same. We hold a Community Grants information session for applicants in advance of each round. Please ensure you are on our mailing list if you would like to receive notification of this event and/or other updates on the Community Grants program. Once you submit your application it is reviewed for completeness and eligibility by our Grants Coordinator. If all is in order, the application is reviewed by our experienced and knowledgeable grants committee who make a recommendation to the Community Foundation board of directors. The board will then make the final approval. Applicants are notified either way of the success of their application. Grantees are invited to a grants celebration to receive their cheque in May or December. The entire process, from deadline to cheque in hand, takes about 3 months. We strongly encourage you to read and follow the guidelines provided below in order to ensure that your application has every chance of success. More information about the process is available in these guidelines. If you are awarded a grant, you will be required to sign a Grant Agreement Form outlining the Terms and Conditions of the grant before you will receive your cheque. Upon completion of your project, you are required to complete a Final Report within 30 days to be submitted to the Community Foundation. The Final Report is intended to help you evaluate the initiative and to help us evaluate the effectiveness and impact of our grants on enhancing and strengthening the quality of life in our community. See Next Steps for more information. Note: Should you be unable to use any of the PDF forms, contact our office and we will provide another version. If you have questions, please contact Penny Scott, our Grants Coordinator, in advance of the deadlines at grants@cfka.org or 613.546.9696.